A grain and vegetable free fish dinner for cats from Lily’s Kitchen that is full of organic and wholesome fresh fish, meat and botanical herbs that are easy for your cat to digest. It also includes organic spirulina, which will give your cat the variety of amino acids and micro-nutrients that it needs to keep them in the best of health. Collectively with the moisture content the recipe has, it can help to prevent any kidney or urinary tract issues as well as GI and digestive issues. Lily’s Kitchen recipes have the specific aim of keeping your cat healthy and happy. Only real meat is used - no rendered animal parts, carcass or derivatives included. All fish is sustainably sourced. Nothing genetically modified, no artificial preservatives, colours, taste enhancers or sweeteners, wheat, corn or soya are used in this recipe. Water based or vegetable based inks are used for the packaging to help minimise waste and toxicity. Produced from 100% Controlled Organic Farming Freshly Prepared: Organic Salmon (30%), Organic Turkey (15%), Organic Chicken (10%), Organic Pork (10%), Organic Spirulina, Carrageenan, Taurine, Vitamins and Minerals. 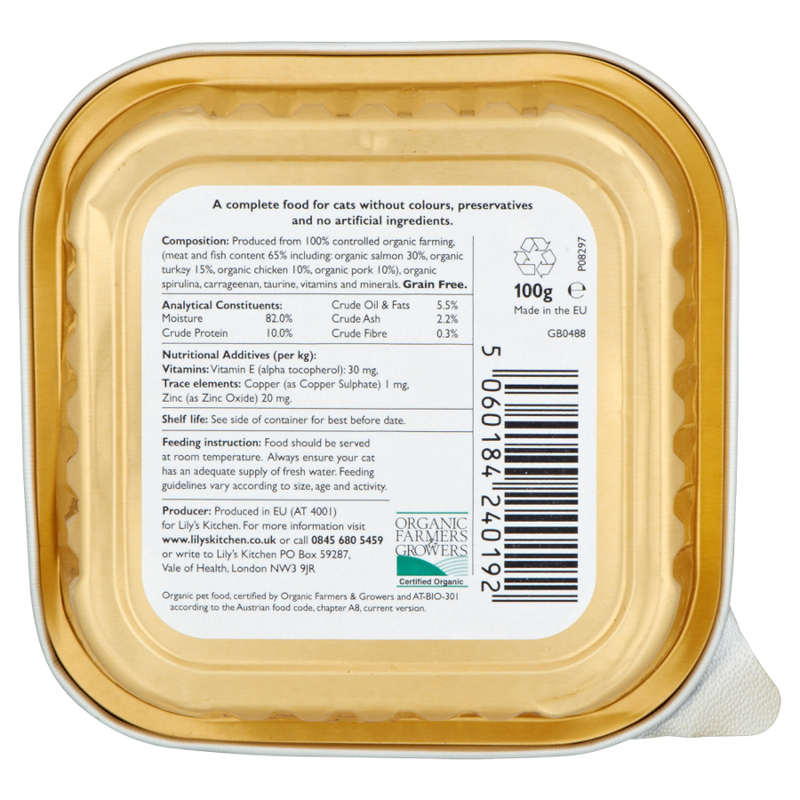 The Lily's Kitchen Organic Fish Dinner For Cats - 85g product ethics are indicated below. To learn more about these product ethics and to see related products, follow the links below. 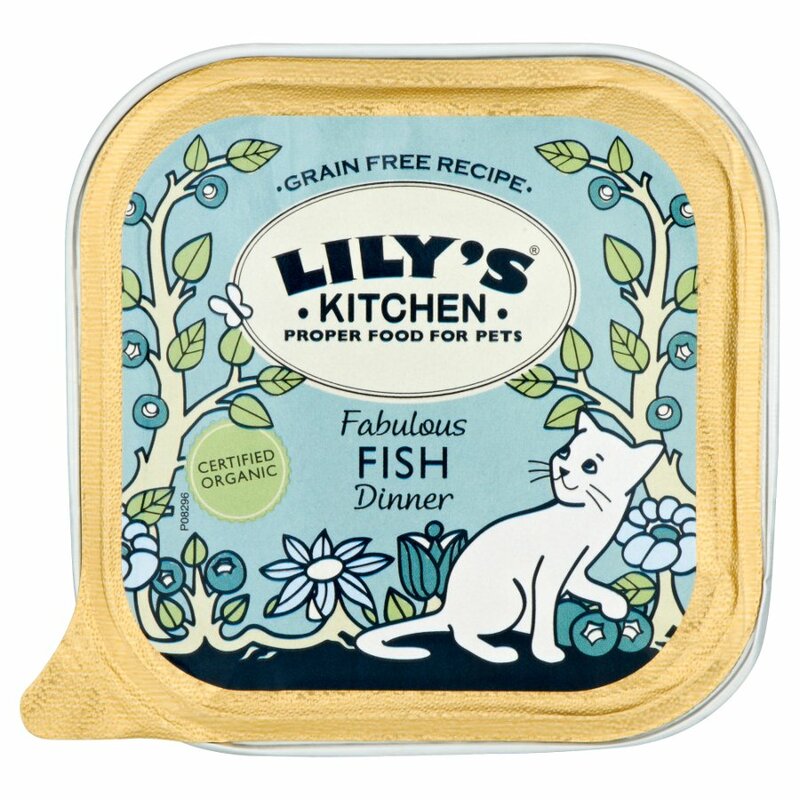 There are currently no questions to display about Lily's Kitchen Organic Fish Dinner For Cats - 85g.